Radios just keep getting better and better. Back in the day, a 6146 backed by a VFIT-100O was a big deal. Now, radios are basically computers with an RF stage or two. The new Icom IC-7000 is the latest amazing rig to combine all-band, all-mode DSP operation in a box smaller than some microphones come in, and with a color screen to boot! They got so much right on this fantastic rig, you just have to wonder how they could have gone so wrong with the antenna tuner. This desktop tuner covers all frequencies from 1.8 – 54 MHz, and will automatically match your antenna in no time. Small, portable tuner designed from the ground up for battery operation. Only 5W" x 7.7D" x 1.5H", and weighing only 1.5 pounds, it handles 0.1 to 125 watts, making it ideal for both QRP and standard 100 watt transceivers from 160 - 6 meters. 0.1 to 125 watt power range (SSB and CW), 100W on 6M. 2000 memories for instantaneous band changing. Controlled from Icom Tuner button on radio. Compatible with any Icom radio that is AH-4 or AH-3 compatible. (6M tuning not available on radios that are only AH-3 compatible) Partial radio list: IC-7000, IC-706MkIIG, IC-718, IC-746 and IC-756. Tuning time: 0.1 to 6 seconds full tune, 0.1 seconds memory tune. 1.8 to 54.0 MHz coverage. Built-in frequency sensor. Tunes 4 to 800 ohm loads (16 to 150 on 6M), 4 to 3200 ohms with optional 4:1 Balun. For Dipoles, Verticals, Vs, Beams or any Coax Fed Antenna. Optional external Balun allows tuning of random length, long wire or ladder line fed antennas. Includes Icom interface cable and coax jumper. Ready to use right out of the box. Small Size Enclosure: 6.5L” x 6.5W” x 1.25H”. Weight: 1.5 pounds. 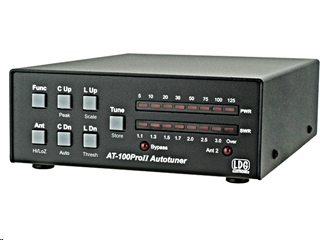 The LDG KT-100 serves as a dedicated tuner for Kenwood radios. Kenwood stopped producing the AT-300 tuner. This is a great alternative. If you have an AT-300 compatible Kenwood radio, you can simply plug the KT-100 into your transceiver with the provided cable; the interface powers the tuner, and the Tune button on the radio begins a tuning cycle. Yaesu radio are among the best, and LDG makes a dedicated bolt-on tuner for the FT-897, but that leaves a big chunk of the Yaesu product line with no dedicated tuner. Of course, most LDG tuners will work just fine with Yaesu radios, but it sure would be nice to have it integrated to the radio. LDG's new YT-100 is just that. An included CAT cable interfaces with your FT857, FT897 and FT-100 (including all D models). This makes it an integrated tuner powered by the interface. No extra power cables are needed. Just press the tune button on the tuner and everything else happens automatically! The mode is set to carrier and the RF power is reduced, a tune cycle runs and the radio is returned to the original settings. 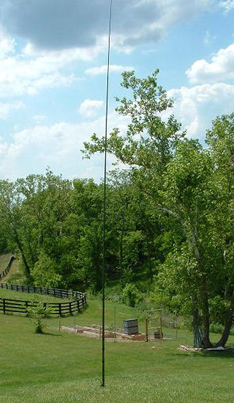 The S9v43' is a heavy-duty, telescoping, self-supporting fiberglass vertical designed for Amateur Radio use from 80 through 6 meters. The S9v43' weighs under 9 pounds, making it the lightest tall vertical on the market. The S9v43' is just over 42' tall and has the same 50 Ohm resonant frequency of 5.44 MHz as some traditional 43' telescoping aluminum verticals. The LDG FT Meter takes advantage of a little known feature on the FT-857, FT-857D, FT-897 and FT-897D. There is a meter jack on the bottom of the front panel. You have to figure that Yaesu knew they needed a bigger display all along, but just left it as an exercise for the user. Well, help is here! The LDG FT-Meter is a low-cost, plug-and-play solution to all your FT metering needs. The FT-Meter presents a lush, highly readable 2.5 inch meter face with calibrated scales for signal strength and discriminator reading on receive, and power output, SWR, modulation, ALC action and supply voltage on transmit. Each function is electable from the radio's menu. Easily visible from anywhere on your desk or dash, the FT-Meter is illuminated by any external 12 vdc source. Current production features a blue backlit display. (The original version had a yellow backlight). The FT-Meter comes fully assembled and ready to go; just plug it into the radio and you are in the picture like never before. Time was, 100 watts was a lot of power. Today, more and more mid-sized amps with 500 watts output are becoming popular. The LDG AT-600ProII is designed for this new generation of power levels. The AT-600ProII will handle up to 600 watts SSB and CW and 300 on RTTY (1.8 – 30 MHz) and 250 watts on 54 MHz. It features LDG’s state-of-the-art, processor-controlled Switched-L tuner. It will match virtually any kind of coax-fed antenna, including Yagis, dipoles, inverted Vs, slopers, loops, just about anything. It will typically match a 10:1 SWR down to 1.5:1 in just a few seconds. You can also use the AT-600ProII with longwires, random wires and antennas fed with ladder line just by adding a balun. The AT-600ProII features two antenna ports with a front-panel indicator showing which is in use, and separate memory banks for each antenna. The optional M-600 4.5" analog meter shows FWD (100 and 600W scales), REV, or SWR in Peak or Average. Easy to read LED bar-graph meters showing RF power, SWR and tuner status, tactile feedback control buttons and an LED bypass indicator complete the user interface. Any power source from 11 – 16 volts DC can be used; the AT-600ProII only draws up to 750mA. Cycle 24’s not going anywhere any time soon. If you power up, LDG’s got your back with the new AT-600ProII. Order yours today.